In today’s coffee marketplace, it’s essential that you have some form of a customer database … and that you routinely use and update that database. Google “customer database software” and choose what works best for your coffee business and situation. Once you’ve entered all your customers into your database, analyze it’s information and segment your customers into buying groups. I personally like to use 4 groups: 1. Platinum, 2. Gold, 3. Silver, and 4. Bronze; categorized by their spending habits of Recency, Frequency, and Monetary (RFM formula –see below). Note their names, their families names, their birthdays, their specific preferences or special needs. You can use this information to interact and keep in touch with them. Which of them would appreciate knowing that you’ve just received that special something they always ask for? If you get in a complimentary item to something they’ve purchased from you in the past, contact them to see if they’d be interested in the new item. Write a weekly or monthly newsletter to relay any pertinent information you think might affect their lives. If you’re sharing valuable information with your customers then they will think of you as a great resource and welcome your communications with them. Send your best customers a special coupon or a little birthday or anniversary gift. Make sure this falls outside of any “loyalty” program you already have in place so they’ll view and value it as a true gift from you. Go above and beyond birthday and anniversary cards and gifts. Inform your customer’s significant other that you have great items in stock so that they can surprise their loved one on this upcoming occasion. Got a new item that you think compliments something they’ve purchased from you in the past? A special occasion is a great excuse to offer them your new item as a free sample. If it truly is something complimentary and suites their tastes, they might start ordering both items on a regular basis. The most powerful words in the English language are “Please” and “Thank you”. Make sure you use these words regularly in all your communications with your customers. Try sending a hand-written thank you letter after any major purchase. Everyone loves to be recognized for their loyalty and value to you. Make sure you have an incentive or loyalty program in place (i.e. buy 10, get 1 free) and link it to that trusty database so you can give them something extra special on their birthday or anniversary … just for being loyal. 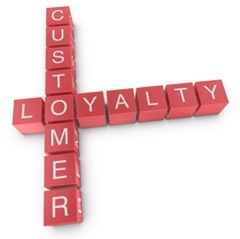 If you’re loyal to your customers, they’ll be loyal to you. Follow this link, the RFM Formula, to learn more about how to use it with your customer data in your marketing campaigns.